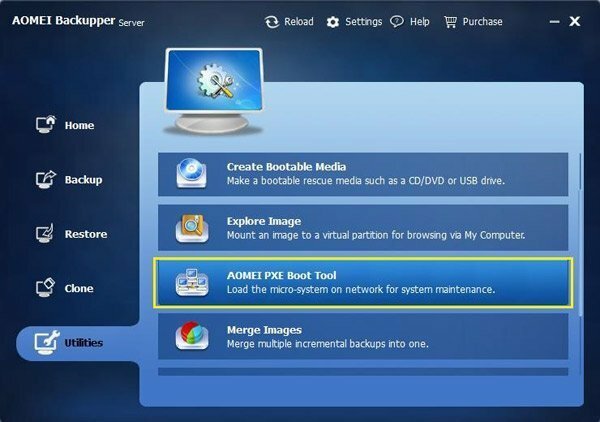 AOMEI PXE Boot software is designed for solving the problem that boots many computers from microsystem within the network. Generally, you can create a Windows PE micro system with a third party tool. Usually, when a computer fails to boot, the way we use to boot a computer almost is using the bootable CD or Bootable USB flash drive, which may be Linux micro-system or Windows PE system. When we need to install system on too many computers, for example, there are 100 computers that need to be installed system, we can’t insert CD or USB into computer one by one and boot computer, because different computers has different configurations such as there may be no CD drive or USB flash drive portal in computers. How to be easy to solve such problems? In this condition, AOMEI PXE Boot Tool will be a key. The only thing you should do is to run AOMEI PXE Boot Tool in one computer (maybe a server) within LAN, and boot other computers (some clients or target computers) from the network. AOMEI PXE Boot Tool can boot many computers from micro system in network. Broadly speaking, You can create a Windows PE micro system with a third party tool, also, you can do a bootable Linux image or Windows PE image file with the tool offered by AOMEI Backupper. You can use AOMEI PXE Boot Tool and make other clients or target computers boot from these microsystem. After booting, you can backup, restore or maintain system with tools offered with the image file. AOMEI PXE Boot Tool supports creating bootable micro system by yourself. Therefore, if you had a powerful Linux bootable ISO or Windows PE bootable ISO, you can boot computers that are in LAN. 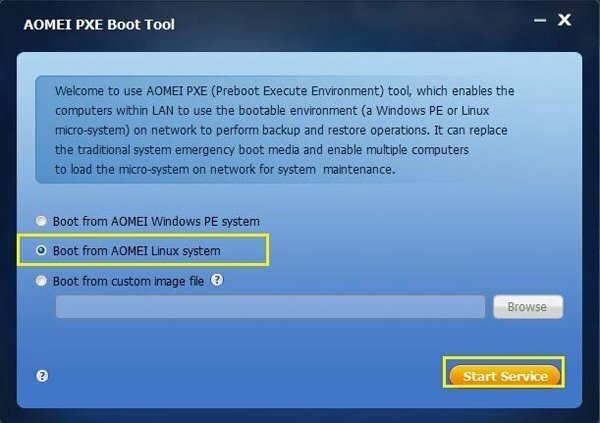 AOMEI PXE Boot Tool can directly create a Linux bootable ISO or Windows PE bootable ISO. If you don’t have them, you can create them with AOMEI PXE Boot Tool. Certainly, you can create a bootable ISO file by using AOMEI Backupper -> Utilities -> Create Bootable Media. If you want to use powerful PE micro system with desktop, you can create ISO file with AOMEI PE Builder, which is freeware offered by AOMEI, and then, you can use it with AOMEI PXE Boot Tool. Step 1. Install AOMEI Backupper on a server or PC that can be booted normally, and launch it. Select “Utility” and then select “AOMEI PXE Boot Tool”. Step 2. Choose the one of the Preboot Execute Environment to start your PC. Boot from AOMEI Windows system: This is a recommended option, so the tool helps you to create directly a Windows PE system for network boot. Boot from AOMEI Linux system: This option can make other clients load a Linux system image in the network. Boot from a custom image file: You can load the special micro-system created by AOMEI PE Builder or Bart PE. Step 3. 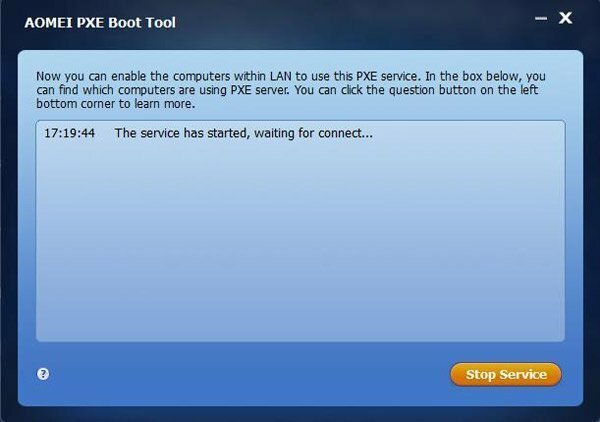 After clicking “Start Service”, AOMEI PXE Boot Tool will configure related data automatically and start the service to wait for target computers. 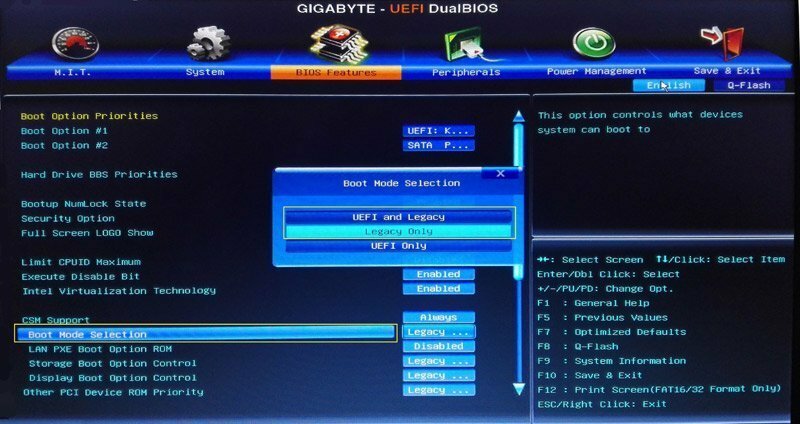 Restart client computer and press specific DEL key to enter “UEFI Dual BIOS”. You can do following the steps for PXE network boot. 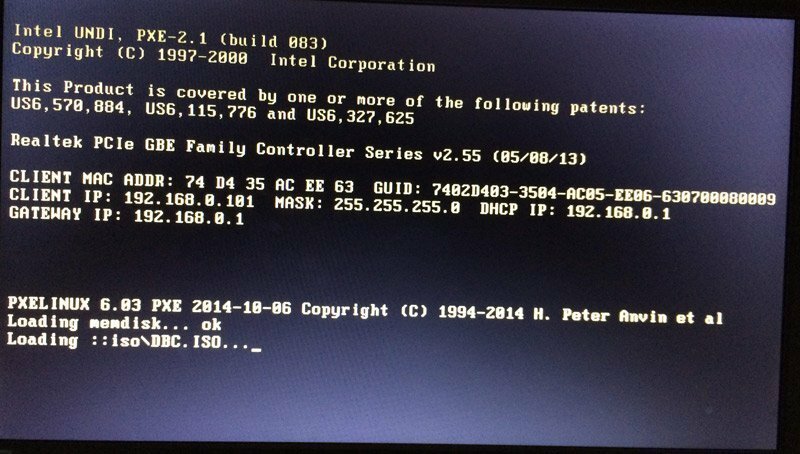 Click Bios Features -> CSM Support -> Boot Mode Selection, and press Enter in “Boot Mode Selection” and a pop-up window will appear, and you should choose “UEFI and Legacy” or “Legacy Only”. Choose “LAN PXE Boot Option ROM” with down arrow, and turn its status from “Disabled” to “Enabled”. You can select “Boot Option # 1” in “Boot Option Priorities”, and then select “Realtek PXE B02 D00” as well as press Enter. 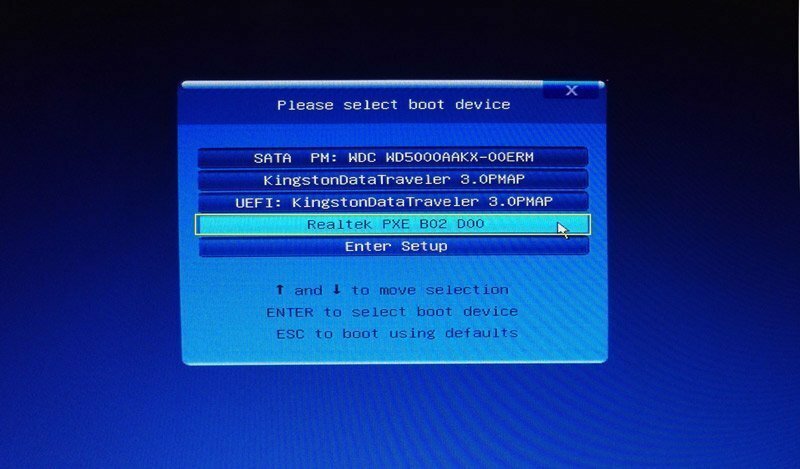 You can also reboot the computer and hit a key (may be F12 or F11), then a window will pop-up below, and then select the first boot device: “Realtek PXE B02 D00” and press Enter. Finally, you can see the following screenshot, this means your computer is booting from PXE network. You may need to wait for a few minutes depending on the speed of the network and the size of the bootable image file. 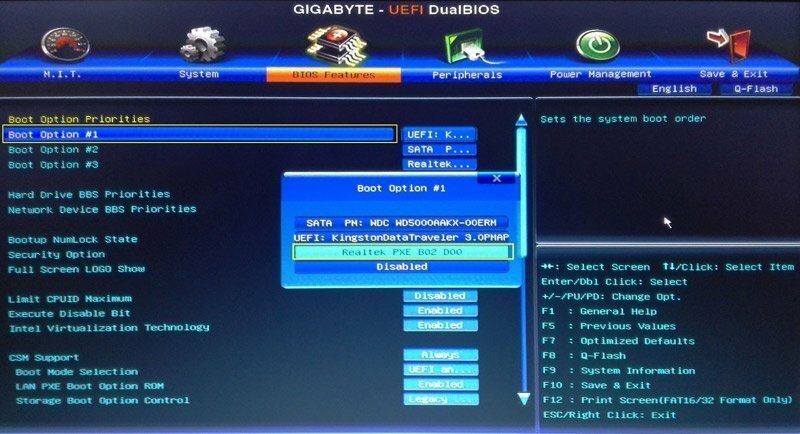 If you want to learn more cases about setting BIOS, please visit How to Set PXE Boot in BIOS? AOMEI PXE Boot software can make bare metals boot and offer an environment to install or maintain system without using CD-ROM or USB flash drive. With the tool, whatever enterprise or personals, maintaining systems in many clients will be easier. Notably to enterprises and associates, they don’t need to handle one by one. You can have a try. You may need to wait 1~2 minutes for the PXE boot process. All computers that are applied with PXE will be same network segment. If there are too many computers such as 100 computers to connect server, the speed of network will be slow. Thus, you should divide network into group so as to boost the network loading. 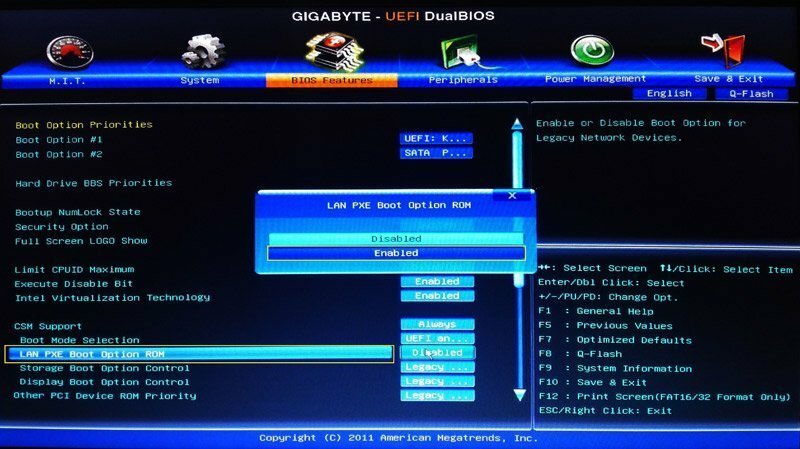 UEFI boot mode is not supported by AOMEI PXE Tool, so you should set the boot mode as Legacy Boot Mode if your computer starts with UEFI. If you encounter other troubles, please visit FAQ about AOMEI PEX Boot Tool.